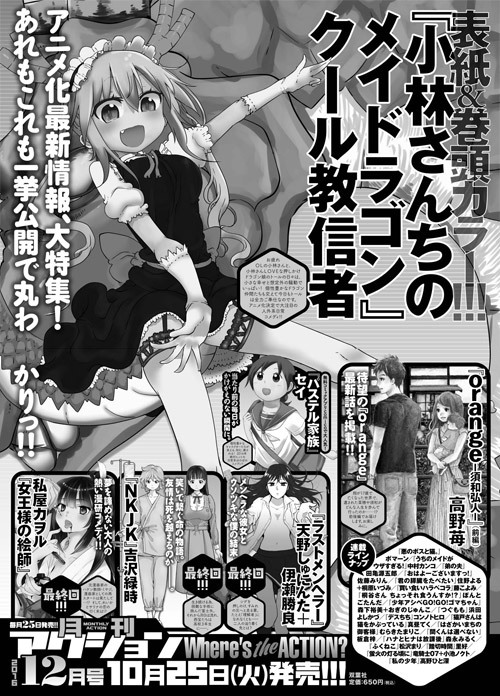 This year's November issue of Futabasha 's Monthly Action magazine announced on Saturday that manga artist Ichigo Takano will draw a two-part spinoff of her Orange manga. The spinoff, titled Orange -Suwa Hiroto- , will focus on Spoiler, highlight text to read: [Naho and Suwa's lives in the world where Kakeru passed away at age 17.] The first half will run in the next issue on October 25. A special edition Orange one-shot manga ran in the magazine in February, and artist Matsupon began a gag manga spinoff titled Sorigerisu in the magazine in March. The spinoff is based on a fictional manga Orange character Saku Hagita reads in the story. The manga inspired a live-action film in December 2015 and a television anime that premiered in July. Crunchyroll is streaming the anime as it airs in Japan.